Goodreads says, "1959 England. Laurel Nicolson is sixteen years old, dreaming alone in her childhood tree house during a family celebration at their home, Green Acres Farm. She spies a stranger coming up the long road to the farm and then observes her mother, Dorothy, speaking to him. And then she witnesses a crime. Fifty years later, Laurel is a successful and well-regarded actress, living in London. She returns to Green Acres for Dorothy’s ninetieth birthday and finds herself overwhelmed by memories and questions she has not thought about for decades. She decides to find out the truth about the events of that summer day and lay to rest her own feelings of guilt. One photograph, of her mother and a woman Laurel has never met, called Vivian, is her first clue. The Secret Keeper explores longings and dreams, the lengths some people go to fulfill them, and the strange consequences they sometimes have. It is a story of lovers, friends, dreamers and schemers, play-acting and deception told against a backdrop of events that changed the world." Laurel Nicolson's life is forever altered one afternoon where she is hiding out in her family's treehouse. While hiding out, she observes her mother, Dorothy, speaking to a man that he has never seen before. What comes next is very out of character for Laurel's mother and in turn, Laurel witnesses a crime. Laurel has kept this secret for many, many years and she starts to remember that life-altering day at her parent's farm when she returns for her mother's birthday. She tries to figure out what exactly happened on that day, but her mother is slowly losing her wits and isn't giving her many clues. While visiting Green Acres Farm, she finds a photograph of her mother with someone she has never met before and Laurel knows that perhaps this could be a clue. Perhaps there is more to her mother's life than Laurel knows and she is determined to figure it all out. 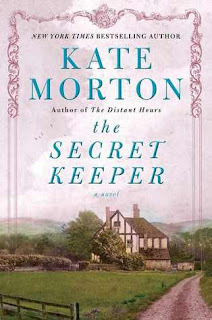 Kate Morton's The Secret Keeper is a page-turner which combines my favorite elements in a story: a good mystery, family drama, romance, and a dark secret. Morton is a tremendous storyteller. I've come to really trust her as a writer and even though the first half part of the book may seem confusing or not related, readers must trust her as it will all make sense soon enough. Just as I did in The Distant Hours, I trusted her again and I am SO glad I did. Morton weaved a beautiful tale in The Secret Keeper; it was the kind of story that makes me LOVE reading. Part of The Secret Keeper's plot is set during WWII, which makes for an exciting tale. The other part is present day and I loved how Morton expertly combined the two. The point of view also varies from Dorothy to Laurel and includes flashbacks, which also adds to the suspenseful plot. Readers will desperately try to piece together the mystery of what truly happened on that fateful day. However, Morton doesn't give us too much information all at once, which again, adds to the mystery. It's not often that I am tricked when it comes to a good mystery. I can usually figure part of it out, but Morton fooled me and I was pleasantly surprised it. By the end of The Secret Keeper, I couldn't believe the outcome and was so impressed by Morton's skills. With that said, I don't want to give away too much of the plot, but I'm sure you can tell I loved this book. Fans of Morton and a good mystery must pick up The Secret Keeper this fall. I guarantee you'll will be guessing what on earth happened that day at Green Acres Farm and will be thinking about the outcome long after you've closed the book. Sounds excellent. I love this review. How it took trust. And I love a good mystery. Thanks, Juju. :) It was definitely one of my favorite reads of the year. Definitely on my to-read list! I really need to read this one, and I also still need to read The Distant Hours. I read The House and Riverton and loved that one, so I should really read more of Morton's books! Great review, Christina! I loved the book, Morton kept me turning pages and whishing to arrive home everyday just for keep with the story. And it was one of the first books I read in English (I'm Spanish): it couln't have been a better choice! I have enjoyed all of Morton's books. This one is her best yet.